Holy filtration! Katadyn just upped the ante for freedom of movement in the mountains with virtually unlimited water. With careful planning, this might be the only water you carry during an ultralight spring mission. It could also complement and slow the consumption of a bladder. Bring a bottle as backup on short day hikes. Use it for travelling in foreign countries. Give one to people in foreign countries. The BeFree comes with all the standard features that a high-quality water bottle should, such as a textured BPA-free finish and wide mouth, but with the amazing bonus of a replaceable filter. The 0.6L (20 fl oz) water bottle is good for up to 1000 liters of water (average sediment levels) per filter and it packs down small enough to fit in a pocket when empty. 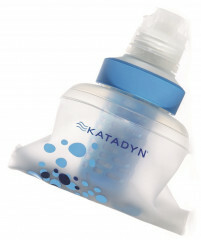 Be Free with this hydration marvel from Katadyn.